Outgoing Lyndon Elementary/Middle School Principal Jeff Kohlman. 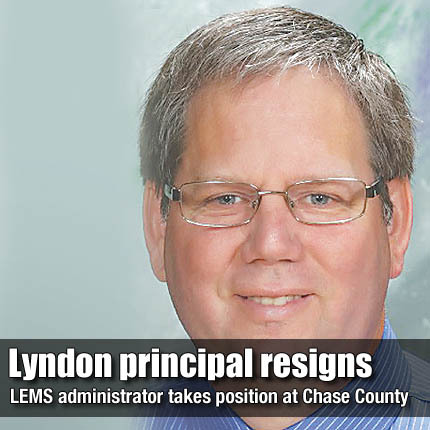 LYNDON—USD 421 will be searching for a new principal following the Jan. 27 resignation of Jeff Kohlman. Kohlman, who has served as principal of Lyndon Elementary-Middle School for eight years, has accepted a job as superintendent of Chase County USD 284, effective July 1. Kohlman said although he is excited to take a position as a superintendent, he will miss the Lyndon community. “I’m going to miss the students and staff,” Kohlman said. His new job will require relocation to his new school district, which encompasses all of Chase County and portions of Morris and Lyon counties.